Later this afternoon we are heading south. Is it wrong that I might be most excited about this? I know that this is my favorite thing to see on the side of the freeway. I feel sorry for those who don't understand what the big deal is. For me, it tastes like home. I cannot wait!! In the meantime, I am going to try to leave you with some sneak peeks. Tomorrow I will show you my desk and I hope to leave a few peeks of client progress early next week. Last night we installed a huge gallery wall and it is GORGEOUS! And I am beyond thrilled to go see family and also see a few new client rooms. Now if you'll excuse me I need to go pack! 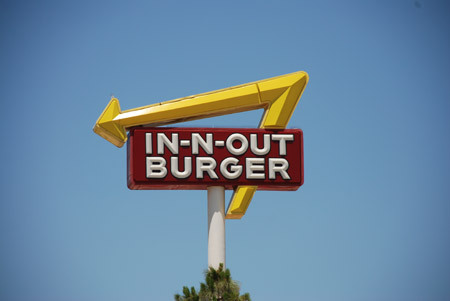 Hope you have an amazing trip :) I have to admit, when my family makes our annual trip to Arizona, I always crave In-N-Out the whole way!